Many patients still think of dental implant supported tooth replacement as a new and unproven treatment, but dental implants have been common dental practice for decades. Actually, some archaeologists believe the ancient Mayans performed implant dentistry thousands of years ago. 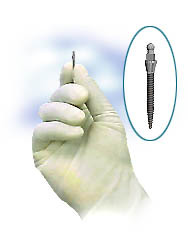 Today, dental implant placement techniques and the materials used have advanced profoundly. Those who are relatively healthy overall and who have adequate jawbone volume and density to support implant posts, have a 96% rate of success. There are some things patients can do to increase their chances for successful dental implant restoration, and the McCarl Dental Group team is happy to help. Rinse the surgical site carefully with warm water for the first 48 hours. McCarl Dental Group is happy to offer patients skilled dental care for even the most advanced oral health concerns including dental implant supported tooth replacement. Contact our knowledgeable dentistry team to find out more or schedule your dental implant consultation today.